Highland boys volleyball coach Jeff Grover recaps the Hawks' victory over Chandler with his players. (AzPreps365 photo). 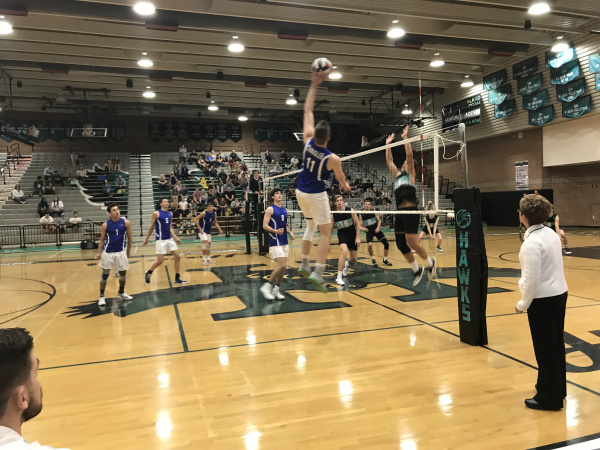 Highland and Chandler were all about four and five-point runs Thursday as they bobbed and weaved through a five-set boys volleyball match at Highland High. The host Hawks rallied from 2-1 down to post a 3-2 win over the Wolves in their 6A non-region match. Scores were 20-25, 25-20, 21-25, 25-20 and 15-11. Highland improved to 4-0 in power-ranking matches while Chandler lost for the first time and rests at 4-1. The Wolves won their first four power-ranking matches without losing a set. "We'd seen them at their tournament, but this was the first time we've played them this year.," Highland coach Jeff Grover said. " We both exited their tournament without matching up. It seems every time we do play them matches go the distance." 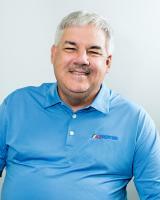 Chandler coach Bobby Robson confirmed Grover's observation. The previous four meetings -- two in the 2017 Wolf Howl (2-1) and one power-ranking match each of 2017 and 2018 (3-2) went to Chandler. Robson conceded Highland deserved Thursday's win. "I thought our effort was really poor," Robson said. "It wasn't up to the effort Highland showed. Jeff's teams are always tough to play. I thought their defensive effort was especially good. Unreal." Highland's attack was led by senior middle Curtis Stone (13 kills) and senior outside hitter Tala Pauga (12 kills). Senior middle Colson Keilich added 8 kills. Libero Kekoa Grover led defensively with 14 digs. Kekoa Grover also delivered a clutch serve in the final set with Highland holding an 11-10 lead. Chandler's Adam Ray goes high for a kill attempt in the Wolves' five-set loss to Highland. (AzPreps365 photo). Kekoa Grove lofted a high, short-serve that had Chandler scrambling to receive. The Wolves returned it, but for an easy kill registered by Stone for a 12-10 advantage. 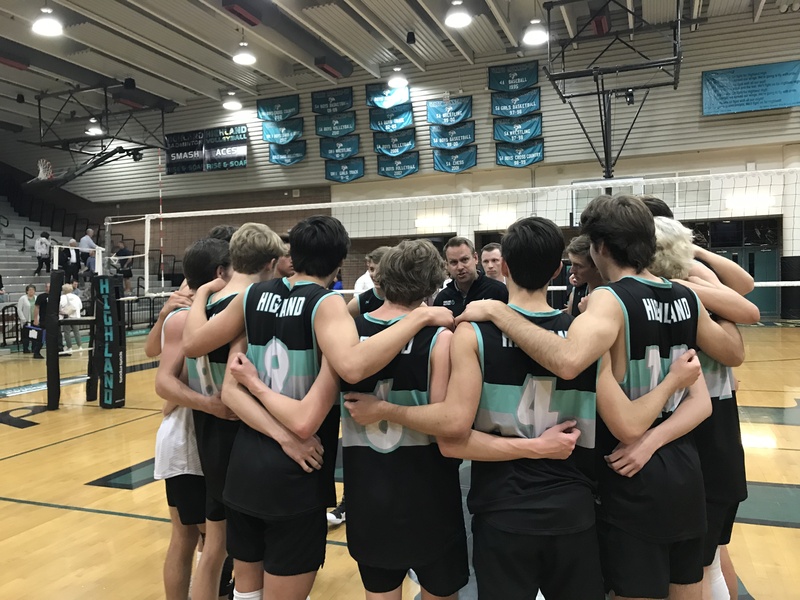 Highland used a 5-1 run in the final set to prevail and scored the final three points via another Stone kill, a Chandler double-hit violation and a kill by the Hawks' defensive specialist Cameron Breinholt. Chandler's offense was led unofficially by outside Tyler Sprungman (17 kills), Braxton Bradbeer (12 kiils) and opposite Adam Ray (8 kills). Chandler won sets one and three with a 6-2 run late in the first after the teams had played even at 14 apiece. In the third set an quick 6-1 advantage melted to a 15-all tie. Another 5-0 run made it 17-12 and the Wolves won the set going away. Highland captured set two and four in much the same manner. A 5-0 run good for a 9-4 lead in the third held up throughout. The fourth set HIghland never trailed and scored four of the final six points that bought a final set.